Guten Morgen aus meinem kleinen Zimmer in der Jugendherberge. Wir kamen in Wien um 10:00 Uhr am letzten Abend und haben sich in der Herberge. Es ist ein wunderbar komfortables Hotel und sehr sauber und effizient. Ich bin begeistert, nach Wien zu kommen, da wir zum ersten Mal von der Möglichkeit gesprochen haben, vor einem Jahr während der letzten Reise. Wir waren in Europa ein bisschen weniger als zwei volle Tage und gestern Nachmittag, bei knapp 24 Stunden Studenten glaubten, sie waren schon seit Tagen verschwunden. Es ist interessant zu sehen, wie der zeitliche Wandel, sowie Fragen der Kultur, vor allem Lebensmittel und Sprache, ihren Tribut an den menschlichen Körper und Geist. Ich erinnere mich an meine Reise nach Ostdeutschland im Jahre 1985 und in einer Ostblock-Nation zu dieser Zeit. Wir durften nicht wandern, wohin wir wollten. Wir wurden beherrscht in Bewegung, Zeit und sogar wo wir essen konnten. Was mich über diese Erfahrung erstaunte, ist, wie schnell ich mich an den Verlust der Freiheiten angepasst habe. Als wir zum Frühstück am Morgen gesammelt, war es amüsant, die Studenten, die amerikanische Frühstück mit Pfannkuchen, Französisch Toast, Eier verschiedener Arten, Müsli und große Saftklassen verwendet werden. Die Herberge Frühstück war Brötchen, Fleisch, Käse, Brotaufstrich und etwas Gemüse. Es waren keine Eier zu sehen. Die letzten zwei Tage war es interessant zuzuhören. Doch alles in allem sind sie gut und sie lernen, dass Reisen interessant und anstrengend ist. Natürlich haben sie mehr Ausdauer als ich, aber ich möchte glauben, ich mache Dinge ein bisschen klüger und effizienter als sie. Heute Morgen sprachen wir beim Frühstück über Wien und die Musikgeschichte in Wien, die natürlich eine reiche und abwechslungsreiche klassische Musikszene hat. Das ist etwas, was die meisten Studenten heute nicht verstehen und manchmal leider nicht schätzen. Meine Geisteswissenschaften Klasse und die Vorlesungen der Kunst, Musik, Literatur, Politik und Religion kommen harkening zurück. Here is a translation of the beginning of my blog, but I felt the need to work on my German, which is both important and a bit rusty. Wish I was here to practice a bit longer. Good morning from my little room in the hostel. We arrived in Vienna around 10:00 p.m. last evening and got settled into the hostel. It is a wonderfully comfortable place and very clean and efficient. I have been excited to come to Vienna since we first spoke of the possibility a year ago during the last trip. We have been in Europe a bit less than two full days and yesterday afternoon, at barely 24 hours students felt they had already been gone for days. It is interesting to see how the time change, as well as issues of culture, particularly food and language, take their toll on the human body and spirit. I am reminded of my journey to East Germany in 1985 and being in an Eastern Bloc nation at that time. We were not allowed to wander wherever we wanted. We were controlled both in movement, time, and even where we could eat. What amazed me about that experience is how quickly I adapted to the loss of freedoms. As we gathered for breakfast this morning, it was amusing to watch students who are used to American breakfast with pancakes, French toast, eggs of various types, cereal, and large juice classes. The hostel breakfast was rolls, meat, cheese, spreads and some vegetables. There were no eggs in sight. During the last two days it has been interesting as I have listened to the sort of cultural overload of the senses for so many who are traveling outside the country for their first time. However, all in all they are doing well and they are learning that traveling is both interesting and exhausting. Of course, they have more stamina than I, but I would like to believe I do things a bit more wisely and efficiently than they do. This morning we were speaking at breakfast about Vienna and the history of music in Vienna, which, of course, has a rich and varied classical music scene. That is something that most students today do not understand and sometimes, unfortunately, do not appreciate. My humanities class and the lectures of art, music, literature, politics and religion come harkening back. . . . it is interesting how quickly time moves. It is actually Saturday morning and the last day of the year. We had our orientation and our first classes at Jagiellonian University yesterday. The first class, presented by Professor Annamaria Orla-Bukowska on the History of the Jews in Central Europe was as stunningly impressive the second time as it was this time last year. Her command of this complex ethnographic history is unparalleled and her ability to connect all the pieces without a single note in front of her impressed students in our group beyond words. After a quick lunch, it was back for the afternoon class on Eastern European Film, Art, and Cultural Studies with Dr. Maciej Stroiński. His rather avant garde style belies his brilliance and the depth of his expertise in this area. Students are literally sitting in the presence of internationally renown scholarship each day as they listen and participate in classes at Jagiellonian. This is the same university where Pope John Paul II attended classes as a student and where students have been learning since 1364. It is the last day of the year and tonight the New Year’s celebration in the market square here in Kraków will see 150,000 visitors. To say it is quite a celebrationmight be a bit of an understatement, but people will surely be happy. This will be my third year here and plans are to go to the same little pub where I have ushered in the last two years. Two years ago, however, I began the trip on my own, visiting the father and fiancé of a former Bloomsburg student. It was during that trip I got acquainted with the program I am here with now. Yesterday as I met Drs. Orla-Bukowska and Stroiński again, it was like returning home. Their graciousness and hospitality are indicative of the Polish people. One of the students on last year’s trip came back in the summer to take Polish language classes and on this coming Monday, I will begin my own language classes. As I have listened to the Bloomsburg students, a common conversational thread has been present. I wish I knew another language better. For me, it was certainly the case that learning another language improved my understanding of my own language. It was definitely in learning another lanaguge that I found my first genuine appreciation for another person’s culture. Perhaps that is the biggest lesson over the last 4 days as students are settling into their Krakówian experience. During the first four days, it was four languages and three countries. It is easy as we are in Bloomsburg to be caught up in the bubble, forgetting there is a complex world going on all around us. 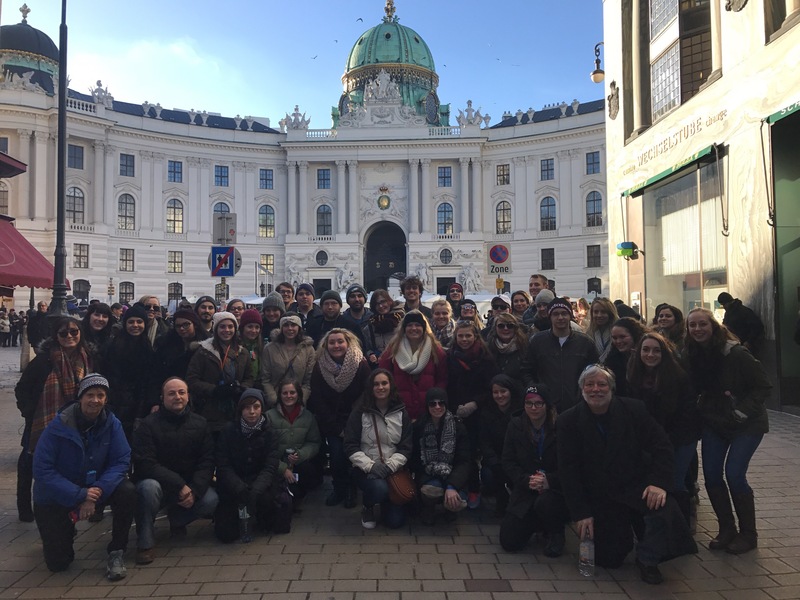 The imersion of this class, and any study abroad program, is unavoidable, but it is also what creates the life-long memories that are being formed throughout each day. As I return to Kraków the third time, the memories of my earlier visits come flooding back. It was on this date two years ago that I found myself lighting a candle for Lydia in the Basilica. I prayed that she might be convinced it was okay to leave this life for the next. It was profound to be in her husband’s native land and praying that he might reach across time and space to greet her. Before the next 24 hours had occurred, that prayer was answered. As I move toward that anniversary of sorts, I am reminded that we are given opportunities to teach and to be taught. That is what I know as I complete another year. The learning never ceases; there is no discontinuing, there is no avoidance if one takes the time to imerse oneself in the process of life. I am certainly not the same person I was the first time I came here. The conversation with students last evening about their first day of classes was gratifying and reminded me of the opportunities and gifts we are given on a daily basis as professors. We are provided with the experiences of learning from those we teach. When you travel with 40 students, those lessons are varied and continuous. The students here in Poland give me hope. They are ready to be sponges soaking up so much of what is happening around them. The classes, the people, the food, and the culture are creating a new fabric and a covering, one that can create yet another layer to their still burgeoning globalized comprehension. While there is an undeniable populism, both in the United States and here in Europe, 40 students are learning about our interdependency and shared history. It is Saturday and the last day of the year, but will be in classes later this morning and until early evening. In the meanwhile, szczęśliwego nowego roku z Krakowa. Thank you for reading.